Purpose: The study was conducted to evaluate the retentiveness of specifically formulated implant cements and compare its retentiveness with a commonly used noneugenol zinc oxide luting cement and also to assess the influence of abutment height on the retentiveness of these cements. Materials and Methods: A master stainless steel mold was used to mount snappy abutment-implant analog complex in acrylic resin. A total of six snappy abutments (Nobel Biocare®) of 4 mm and 5.5 mm height with their analogs were used. A total of 66 ceramill® Sintron metal copings fabricated using computer-aided design/computer-aided manufacturing system and divided into six groups (n = 11) according to the height (three 4 mm abutment and three 5.5 mm abutment). The cements that were compared were a Noneugenol zinc oxide provisional cement (Temp-BondTM NE), a Noneugenol temporary resin cement (Premier® Implant Cement) and a resin based acrylic urethane cement (Implalute® Implant Cement). After cementation samples were immersed in artificial saliva for 7 days and subjected to a pull-out test using a universal testing machine at a crosshead speed of 1 mm/min. The load required to de-cement each coping was recorded and analyzed using one-way ANOVA, post hoc multiple comparison, and independent t-test. Results: Noneugenol temporary resin cement had the highest tensile strength followed by noneugenol zinc oxide cement and the least retentive strength was observed in resin-based acrylic urethane cement. Conclusion: The results suggest that noneugenol temporary resin cement may be considered as a better choice for cementation of implant prosthesis, as it has shown to have better mechanical properties. Implant supported prosthesis may range from a single tooth replacement to multiple replacements and they are predominantly fixed restorations. The two modes of retention of the suprastructure to the implant abutment component are by means of a prosthetic screw or cement retention. The preferred mode of retention is usually an informed choice made by the clinician based on the need of the clinical situation or the desired outcome. One would reasonably expect that those cements generally formulated as permanent luting cements would be at the top of the retention list; however, Mansour et al. 2002 found that the rank order of cement retentiveness differed when tested on implants rather than on natural teeth. Abutment surface preparation, and the abutment taper, width, and height also affect the retentive strength of cement-retained implant-supported restorations. At present, the majority of cements used in implant dentistry have been designed for use with the prostheses cemented to natural teeth. 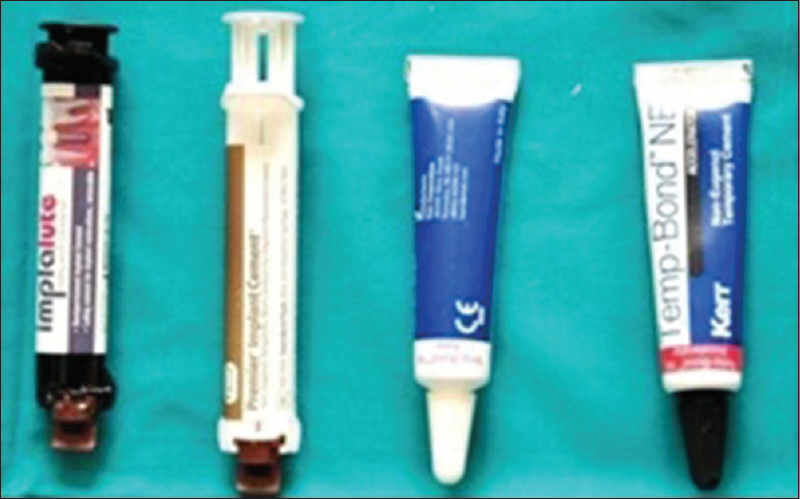 Of late, various manufactures have introduced cements specifically formulated for cementation of implant-supported prosthesis, and claim several advantages. However, there are limited studies that have been conducted to study the retentive properties of these specifically designed cements. Therefore, this study was designed to evaluate the cement failure load (CFL) of specifically designed implant cements and to compare it with that of temporary luting cement used commonly for cementation of implant-supported prosthesis. This in vitro study was designed to compare two specifically formulated luting cements for implant restoration, Implalute® Implant Cement (ILC) (a methacrylic-based urethane resin cement Medicept dental, UK Ltd.) and Premier® Implant Cement™ (PIC) an elastomeric resin based zinc oxide cement (Premier®, PA, USA) with Temp-Bond™ NE a temporary luting cement (TB) (Kerr Corporation, Orange, CA, USA) [Figure 1]. A total of six implant abutment complex were made using regular platform (RP) Snappy Abutments of two different heights 4.0 mm and 5.5 mm (Nobel Biocare®, India private Ltd.,) and corresponding implant analog of RP (Nobel Replace-Nobel Biocare® India private Ltd.). They were tightened together with a titanium alloy screw at 25–30 Ncm of torque as recommended by the manufacturer. This complex was aligned vertically into a metal mold with the help of a dental surveyor (Marathon-103 Surveyor; Saeyang company, Daegu, Korea) to which a self-cure acrylic resin (DPI-RR, The Bombay Trading Corporation Ltd, India) was poured to the level of the implant analog. Thereafter, impressions of the implant abutment complex were made using elastomeric impression material and polyvinyl siloxane impression material (Aquasil soft putty/regular set and Aquasil Ultra/light bodied consistency; Dentsply Caulk). Onto to this, the abutment replicas (Nobel Biocare® India private Ltd.,) were inserted and type IV die stone (pearl stone; Asian chemicals, Jay Krishna, India) was poured. The stone models were scanned by means of a three-dimensional-digital laser scanner (Ceramill® Map 400). A total of 66 metal copings were designed and fabricated (33 for 4 mm and 33 for 5.5 mm abutment height) using computer-aided designing and computer-aided manufacturing system (Ceramill® CAD/CAM system, Amann Girrbach Austria). Copings were designed with a cement gap of 0.05 mm with a standardized metal thickness of 0.8 mm and a loop attachment was added to the occlusal surface of each coping [Figure 2]. The copings were divided into two control groups and four test groups. Each group had 11 copings and were assigned to two different abutment heights of 4 mm and 5.5 mm for three different luting cements. Group TB for Temp Bond (Group ATB for 4 mm and Group BTB for 5.5 mm). Test Group PIC for Premier® Implant Cement™ and test Group ILC for (Implalute® Implant Cement). Both the test groups were subdivided as A and B for two different abutment height. The copings were cemented to the abutment at room temperature using the respective cements assigned to each group as per the manufacturer's recommendations. Before cementation care was taken to cover the abutment screw access holes with putty impression material. Copings were seated on the abutments by firm finger pressure for 10 s, followed by 2 kg constant axial compressive load for 3 min [Figure 3]. Excess cement was removed using a curette and the specimens were kept in artificial saliva (Moi-Stir Kingswood Laboratories, Inc., USA) for 7 days. After the aging process, the dislodging forces of the copings were measured using a universal testing machine (TSI-Tec-Sol India) [Figure 4]. The experimental procedures were repeated for each coping in all six groups, the same abutments were used for every testing. A spoon excavator was used to remove the residual cements from the abutments and immersed in ultrasonic cleaner for 15 min. The cleaned abutments were rinsed in distilled water, dried, and visually inspected to ensure the complete removal of the luting cements and the next coping was cemented and tested. 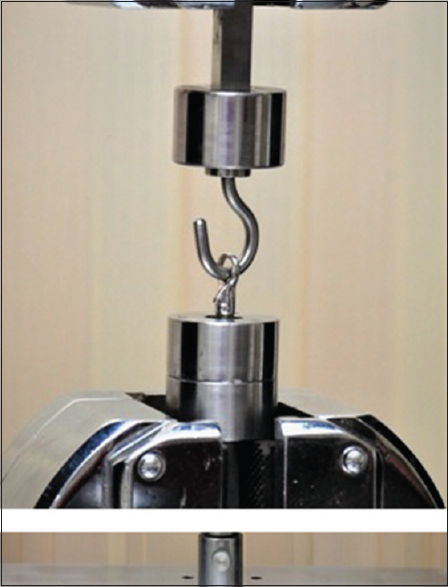 All the 66 samples were secured to the holding device of universal testing machine (TSI-Tecsol; India) to perform tensile loading tests under static condition [Figure 5]. 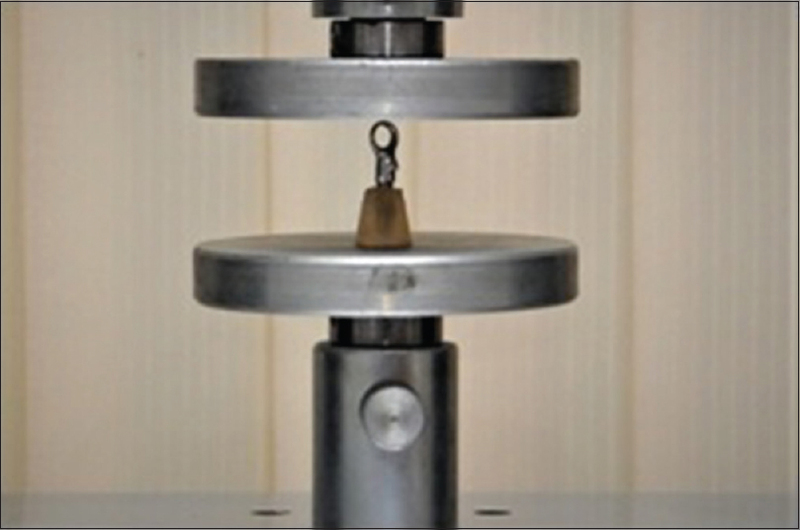 Samples were subjected to tensile load at a crosshead speed of 1 mm/min. The load required to de-cement each coping was recorded in kilogram force. This load was divided by the surface area of the abutment to get the tensile strength which was in the unit of kgf/mm2. Later, it was converted into MPa and the mean values of each group were determined and statistically analyzed using one-way ANOVA, post hoc Bonferroni test for multiple comparison, and independent t-test for the comparison between the two different heights. One-way ANOVA was used to compare the mean tensile strength (MPa) between the cement groups at 4 mm abutment height. It was observed that there was a significant difference in the tensile strength between the cement groups; PIC had the highest tensile strength (0.77 ± 0.13) followed by TB (Temp-Bond™ NE - 0.67 ± 0.25) and the least strength was observed in ILC (ILC - 0.23 ± 0.12) with P < 0.001 [Table 1]. The same observation was noted with 5.5 mm abutment height [Table 2]. Post hoc Bonferroni test was done for multiple comparisons. It was observed that there is no statistically significant difference between the group PIC and TB. However, the groups PIC and TB when compared with ILC and showed statistically significant difference in values between each groups (P < 0.001) [Table 3]. 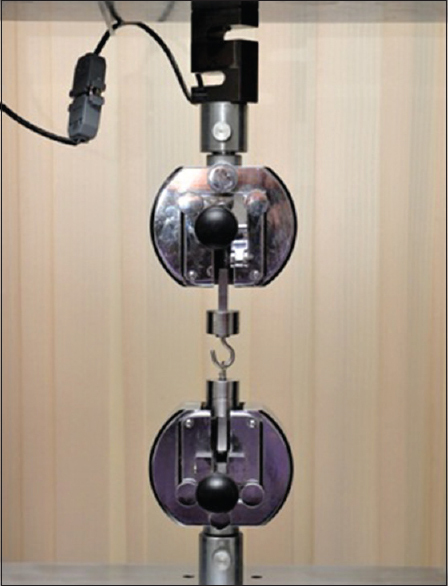 Independent t-test showed no statistically significant difference between the height groups, although the height-B (5.5 mm) showed better tensile strength when compared to height-A (4 mm). The results showed statistically significant difference between the cements with P = 0.001 for 4 mm height and P = 0.004 for 5.5 mm height [Table 3], [Table 4] and [Figure 6]. This study was conducted to evaluate the cement failure load (CFL) for two new specifically formulated luting cements (PIC and ILC) for implant-supported prosthesis and the commonly used provisional luting cement (Temp-Bond™ NE). Metal copings were fabricated and cemented using all the three luting cements, and the tensile load to cause cement failure was recorded using a universal testing machine. 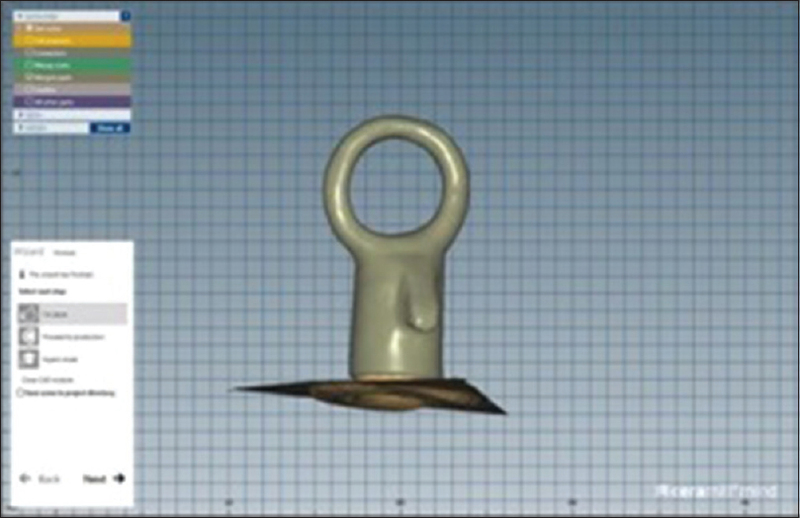 The study showed the maximum tensile strength of 1.08 MPa for the PIC. The tensile strength recorded for the cement TB was almost in the same range and the least tensile strength value recorded was for ILC (0.10 MPa). In this study, although the result was not statistically significant between PIC and TB, the noneugenol temporary resin cement (PIC) showed slightly better retentive property than that of noneugenol zinc oxide cement (TB). Noneugenol temporary resin cement provided secure retention and excellent marginal seal. It is a very tough resin that uses mechanical retention to adhere the crown to the abutment. Yet, when desired, the restoration can be removed easily due to its unique elasticity. Different coefficients of thermal expansion of the materials, a poor marginal seal provided by zinc oxide cements and its high solubility in water could have been the factors responsible for this observation. Sheets et al., 2008 got similar results, they concluded that there was no significant difference between the noneugenol temporary resin cement and noneugenol zinc oxide cement; but the retentive value is better for the noneugenol temporary resin cement. On the contrary, Gultekin et al., 2012 compared seven provisional cements and found that there was a significant difference in retention between Premier® and Temp-Bond™ NE cements. It has been established that zinc oxide eugenol (ZOE) cement (Temp-Bond™) has high solubility in direct contact with water and also requires sufficient time for a complete setting reaction to maximize its retention. However, the same has not been reported for noneugenol zinc oxide resin cement and has been used when longer cementation periods were required. Further research regarding the precise mechanism responsible for this observation with noneugenol zinc oxide resin cement is required. 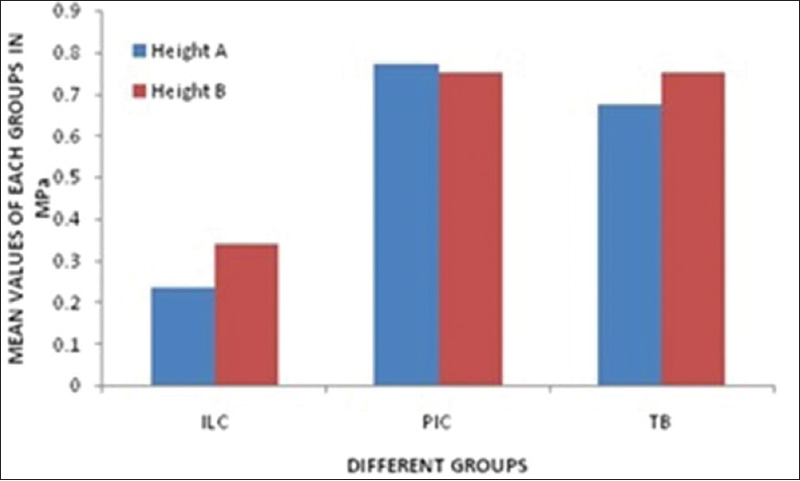 Resin-based acrylic urethane cement (ILC) had the lowest retentive strength compared to other cements used in the study. There was significant difference between resin-based acrylic urethane cement (ILC) and the other two cements used in this study. Manufacturer claims that it has got significantly lower displacement resistance than conventional cements, and it can be used as semi-permanent cement for customized abutment or abutment with reduced adhesion surface; particularly small abutments. It has an extremely low film thickness (only 8 μm) for maximum fitting accuracy. The metal copings used in this study had 0.05 mm cement space, and it may be reasoned that the reduced CFL with ILC may be due to the increased film thickness which may have compromised the physical properties of the cement, caused marginal leakage which led to disintegration of the cements. As ILC is a relatively new material in the market, and there was no study published on this cements retentive properties in literature to substantiate these claims. Although there was no statistically significant difference in the values, increasing the abutment height improved the retentive abilitiy of all the cements in the present study. However, in this study, only 4 mm and 5.5 mm heights were investigated. Al Hamad et al., 2011 stated that an increasing height was effective with permanent cement but had no effect on temporary cements (e. g., ZOE). Increasing the abutment height by 2 mm was not significant enough to increase the surface area of the abutment and/or the mechanical interlocking of the cement to the point that would result in a statistically significant result. Accordingly Akca et al., 2002 observed that abutment height and cement type affected the Uniaxial Resistance Force (URF) of cements. Similarly, Kent et al., 1997 also observed an interactive effect between cement type and abutment height. Covey et al., 2000 stated that abutment height and height to width ratio were positively related to retention strength, whereas an abutment total surface area and width were not. Using these results, the clinician should carefully consider the choice of cement when the risk of component loosening is high; in these situations, the weaker cement may be clinically ineffective. Further research regarding cemented implant crowns may investigate dental cements with various implant systems under validated, standardizedin vitro conditions. The development of cements specifically for use in implant dentistry may be warranted. Alternatively, dental cements may continue to be selected on a case-by-case basis according to individual cement advantages and the anticipated requirement for crown retrievability. The cement space used in this study is 0.05 mm, which may have compromised the retentive properties of the resin-based luting cements, as a higher film thickness would have compromised their physical properties. Within the limitations of this in vitro study, it can be concluded that noneugenol temporary resin cement may be considered as a better choice for cementation of implant prosthesis, as it has shown to have better mechanical properties such as adequate retentiveness, good marginal adaptation that prevent microleakage, effortless excess cement removal, and also ease of retrievability. Manawar A, Dhanasekar B, Aparna IN, Naim H. Factors influencing success of cement versus screw-retained implant restorations: A clinical review. J Osseointegration 2012;4:43-7. Singer A, Serfaty V. Cement-retained implant-supported fixed partial dentures: A 6-month to 3-year follow-up. Int J Oral Maxillofac Implants 1996;11:645-9. Chee W, Jivraj S. Screw versus cemented implant supported restorations. Br Dent J 2006;201:501-7. Hebel KS, Gajjar RC. Cement-retained versus screw-retained implant restorations: Achieving optimal occlusion and esthetics in implant dentistry. J Prosthet Dent 1997;77:28-35. Tarica DY, Alvarado VM, Truong ST. Survey of United States dental schools on cementation protocols for implant crown restorations. J Prosthet Dent 2010;103:68-79. Kapoor R, Singh K, Kaur S, Arora A. Retention of implant supported metal crowns cemented with different luting agents: A comparativein vitro study. J Clin Diagn Res 2016;10:ZC61-4. Garg P, Gupta G, Prithviraj DR, Pujari M. Retentiveness of various luting agents used with implant-supported prostheses: A preliminaryin vitro study. Int J Prosthodont 2013;26:82-4. Bernal G, Okamura M, Muñoz CA. The effects of abutment taper, length and cement type on resistance to dislodgement of cement-retained, implant-supported restorations. J Prosthodont 2003;12:111-5. Chandra Shekar S, Giridhar K, Suhas Rao K. An in vitro study to evaluate the retention of complete crowns prepared with five different tapers and luted with two different cements. J Indian Prosthodont Soc 2010;10:89-95. Farah R, Elzeky M. An in vitro comparison of marginal microleakage of four groups of temporary cements in provisional crowns. Int J Adv Res 2015;3:778-87. Dantas TS, das Neves FD, do Prado CJ, Naves LZ, Muniz LA. Effects of abutment taper on the uniaxial retention force of cement retained implant restorations. Rev Odontol Bras Cent 2013;22:110-4. Meshramkar R, Nayak A, Kavlekar A, Nadiger R, Lekha K. A study to evaluate the effect of taper on retention of straight and angled implant abutment. J Dent Implants 2015;5:3. Sheets JL, Wilcox C, Wilwerding T. Cement selection for cement-retained crown technique with dental implants. J Prosthodont 2008;17:92-6. Gultekin P, Gultekin BA, Aydin M, Yalcin S. Cement selection for implant-supported crowns fabricated with different luting space settings. J Prosthodont 2013;22:112-9. Covey DA, Kent DK, St Germain HA Jr., Koka S. Effects of abutment size and luting cement type on the uniaxial retention force of implant-supported crowns. J Prosthet Dent 2000;83:344-8. Saleh Saber F, Abolfazli N, Nuroloyuni S, Khodabakhsh S, Bahrami M, Nahidi R, et al. Effect of abutment height on retention of single cement-retained, wide- and narrow-platform implant-supported restorations. J Dent Res Dent Clin Dent Prospects 2012;6:98-102. Akça K, Iplikçioǧlu H, Cehreli MC. Comparison of uniaxial resistance forces of cements used with implant-supported crowns. Int J Oral Maxillofac Implants 2002;17:536-42. Kent DK, Koka S, Froeschle ML. Retention of cemented implant-supported restorations. J Prosthodont 1997;6:193-6. Kunt GE, Ceylon G, Yilmaz N. Effect of surface treatments on implant crown retention. J Dent Sci 2010;5:131-5. Jørgensen KD. The relationship between retention and convergence angle in cemented veneer crowns. Acta Odontol Scand 1955;13:35-40. Jain JK, Sethuraman R, Chauhan S, Javiya P, Srivastava S, Patel R, et al. Retention failures in cement- and screw-retained fixed restorations on dental implants in partially edentulous arches: A systematic review with meta-analysis. J Indian Prosthodont Soc 2018;18:201-11. Shrivastav M. Effect of surface treatments on the retention of implant-supported cement-retained bridge with short abutments: An in vitro comparative evaluation. J Indian Prosthodont Soc 2018;18:154-60.